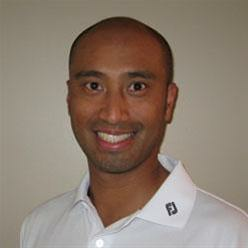 Dr. Harry Sese specializes in golf injury treatment and physical conditioning. He provides care to professional and amateur golfers throughout North America. Dr. Sese is TPI certified and a speaker for TPI seminars in Canada. In addition to his passion for golf, Dr. Sese is a Master Instructor and former national champion in Taekwondo. He is a nationally certified coach and has trained several top athletes including former Olympians. Dr. Sese is the Medical Director and Team Doctor for the World Taekwondo Federation (WTF) in British Columbia, Canada. He has been nominated for an award this year from the WTF headquarters in Seoul, South Korea for his contributions to the sport. With a background in chiropractic, manual therapy, human biology, and training elite athletes, he has taken an interest in using the philosophy and training principles of the martial arts to help golfers achieve optimal biomechanics, a positive mental attitude, and maximum performance. Dr. Sese, also known as “The Golfing Doc”, is based in British Columbia, Canada and Seattle, Washington.